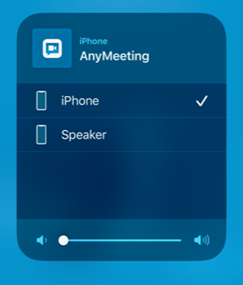 Intermedia AnyMeeting Mobile App allows you to start an ad-hoc meeting or a scheduled meeting right from your Mobile Device. 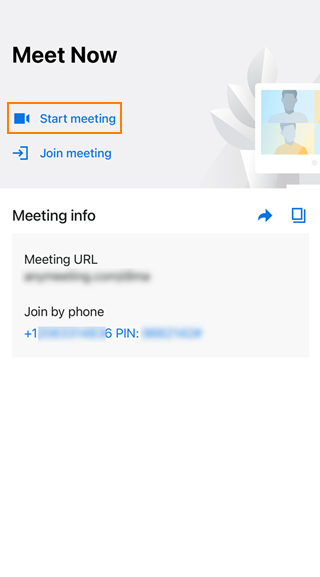 To host a meeting on your mobile device, download the Intermedia AnyMeeting app from Google Play Store for Android devices or App Store for iOS devices. When opening the Mobile app login as you would on the computer via web browser. Once logged in to your account you will see your Meeting URL, Dial-in information that you can share with other users. Below that, the Start Meeting button and upcoming meetings for today are shown. You can see Today’s meetings that you have scheduled. You will be able to start those meetings up to one hour prior to the scheduled meeting time as noted. Only Meetings may be started/hosted on the Intermedia AnyMeeting Mobile app. Any scheduled Webinars must be started from PC. There is also an option to Host or to Join a meeting. When you select START A MEETING, it will open your meeting on your phone. On the left navigation you have buttons to choose areas of your meeting such as the Attendees, Chat, and Notes. Or use webcam and microphone and for Pro customers - Record your meeting. Important: The ability to share slides, MP4 and desktop screen sharing are not yet available.